Can you really save money homeschooling or do you have to always pay retail? Of course not! Homeschoolers are some of the most resourceful people I know. My goal in helping other homeschoolers is to encourage them to homeschool as long as possible and remove as many obstacles as possible. For many people, money is the obstacle that keeps them from wanting to homeschooling or being able to continue homeschooling. If money is keeping you from homeschooling, realize that it doesn’t have to be an obstacle. Many people have home schooled with absolutely no money at all. Think back to the days when school was in a one room schoolhouse and all you had was a slate and a piece of chalk. Granted, those people were not preparing to go to college, but they certainly learned what they needed to know. Many people have lots of money to spend on homeschooling, but money doesn’t always make a good homeschool or a great homeschool year. Money can help provide the resources you WANT for your children, but may not be what they NEED. 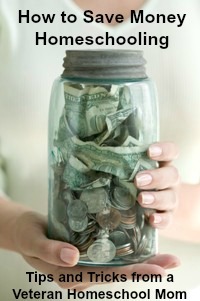 So many families have found ways to save money homeschooling and I am certainly willing to share what I have learned. This list is in no way comprehensive, but it does contain some great tips that I have used. Check with friends or other homeschool families that you might know - If you know of a book or curriculum you want to use for homeschooling, chance are someone in your area has probably used it. Sometimes you even have something the other family would want to trade. You might also find a good friend that would want to buy a book this year while you buy a different book and then you can switch off the next year. That way you can bot save money on homeschooling at the same time. Homeschool Conventions - Many homeschool conventions have areas where you can save money on homeschooling by purchasing used homeschool material on the spot. Other vendors offer free shipping if you order at the convention. If you purchase books and resources there, you won’t have to pay shipping, just the price of admission which is almost always worth the cost of the great workshops you get to hear. Homeschool Classifieds - This is a very user-friendly site that allows you to search for, sell, and buy homeschool books and curriculum. If you don’t find what you want, you can post a "wanted" item. I have been able to find several items that I was looking for by posting in the "wanted" section. Within a month someone contacted me saying they had that item for sale. I have had good success with selling on this site too. It’s easy to list items here and very reasonable. That’s one way to homeschool for free, by reselling what you just used so that you can have money to buy what you will need in the future to help you save money homeschooling. Publisher message boards - Some curriculum publishers allow their users to advertise their used curriculum for sale on their message boards. If you purchase a packaged curriculum, check with the publisher to see if they offer this service. I know Sonlight has this service included with their curriculum to help their members save money homeschooling. Online Resources - You can take advantage of many online resources to save money on homeschooling such as lesson plans, games, worksheets, and free reprint books. You can usually find what you need on Google, check free homeschool worksheet pages, or use a resource with websites already reviewed for you. Used Curriculum Sales - If you know other homeschoolers in your area or if you’re on a homeschool e-mail group, you can keep up on the used homeschool book sales that come up in your area. 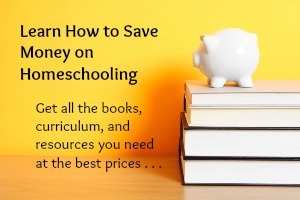 These sales help both the buyer and seller save money homeschooling. If you go to a sale, make sure you get there early. Many times there are free resources available outside before you go into the sale. It always pays to be one of the first people there. Most of the good deals and most sought after books usually are snatched up in the first 15 minutes. Book Mooch - There is a web site in the Internet called http://www.bookmooch.com. Although you won’t find complete curriculums here to get for free, you can find many books that you can use for free. You just sign up for a free account and search for a book you would like. You are encouraged to look over the books you have at home that you don’t need any more that can be given away. If you receive a book, the giver pays the shipping. If you give a book away, you pay the shipping. If you have lots of books you want to get rid of to a good home, this is a great place to list them. It’s wonderful to receive a book that you didn’t have to pay anything for. Online Book Sellers - Although not one of the cheapest sources, these three are still worth mentioning. You should be able to find just about any book at Amazon, Half.com or eBay. If you have the ISBN number, you don’t have to do any searching. You just type that number in and find out right away if the book is available and the lowest price. Library Sales - Libraries have many great resources available for homeschooling. Here again, you will not find a full curriculum, but you can find many interesting and useful books that just might be your children’s favorites. If you hear of a library sale, make sure you get there at the very beginning to get the best selection. Use the Library - The library is always there for us. You pay tax dollars for your library to run, so you might as well make full use of it. If you have a small library, have no fear, the world is available to you. Most libraries now offer inter-library loaning which means that if your library doesn’t have the book you are looking for, they can request it from another library. If you enjoy managing your library account online, many libraries let you request books online and then notify you by e-mail when your book or resource comes in. You can also request books you are thinking about purchasing for homeschooling. If you like the book and decide you want it in your home library, then you can always purchase it then. Resell What you Just Used - Reselling your used curriculum doesn’t have to be difficult. If you remember a few key points about selling used homeschool books, you will be well on your way to getting your books listed and sold and out the door. Then you will have more money available to you to and save even more. Use Older Versions - Even though older versions are not always the ideal, if money is tight and you need to save money homeschooling, older versions just might be what will help keep you from overspending your homeschool budget. I know of a few publishers where parents like the older versions better than the newer versions anyways. Evaluate whether you really need the teacher’s version - Teacher’s versions can tend to get expensive. If you have used a certain product before and know that you can do without the teacher manual, then you will be able to save a little bit of money going that route. If you are not sure if you will need a teacher manual, you can purchase it and return it after you look through it and decide you don’t need it. That is not the ideal, but is an option you can use if you’re just not sure and need to find a way to save money homeschooling. Don’t buy the whole set - Some books, curriculum, and resource sets can be used very effectively without all the added pieces and parts. If you’re short on cash and want to save money homeschooling, you might want to ask someone who has used this set that you are looking at and if there is any way to purchase less than what is suggested. Shop Dollar Stores for Your Supplies - If you don’t have a chance to get in on the back-to-school deals when they happen, or find out in the middle of the year that you need something you don’t have, Dollar Tree, Dollar General and Family Dollar are some of my favorite stores. They have the school supplies I need, for the price I need them, without making me go into a huge store with lots of other things to tempt me. Try them, you just might find that these stores help you save money homeschooling AND save time too! 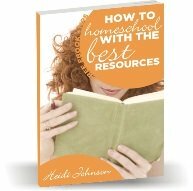 Take Advantage of Free Resources - Besides using free resources on the Internet, I have written several free homeschool ebooks and a free homeschool planner, that you can take advantage of to help you save money homeschooling. Just because something is free, doesn't mean it doesn't have value to you. Sometimes my favorite resources have been free or very inexpensive.